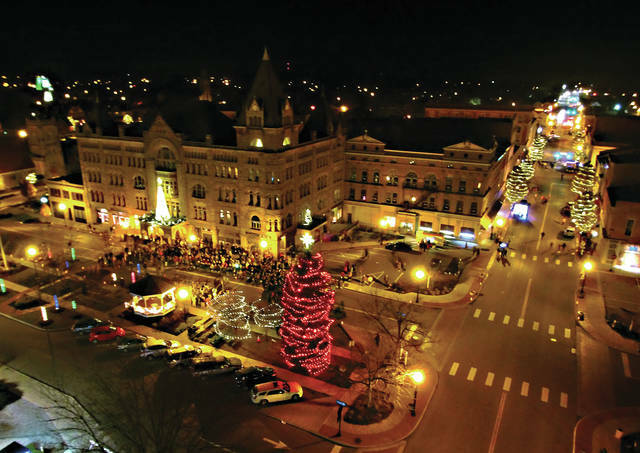 Mike Ullery | AIM Media file photo Fort Piqua Plaza illuminated during the 2017 Christmas on the Green celebration. A gala to celebrate the building’s restoration and reopening 10 years ago is planned for Nov. 16. Invitations and tickets will become available in October. PIQUA — With the 10-year anniversary of the $22 million restoration and reopening of the Fort Piqua Plaza coming up in October, the Friends of the Piqua Public Library will be commemorating it with an evening of elegance. A gala hosted by the Friends of the Piqua Public Library will be held on Friday, Nov. 16, at the Fort Piqua Plaza, featuring the Dayton Philharmonic Orchestra with Artistic Director and Conductor Neal Gittleman. Invitations and tickets for the gala will be made available in October. Funds raised from the gala will go back into maintaining the building. “We contribute to the maintenance fund of the library to help with all of the restoration, upkeep, and repairs,” Julie Benkert said. Kathy Alexander of the Friends of the Piqua Public Library said that having the Fort Piqua Plaza restored and in use has been like having a cultural center, noting the historic value of the building. “It’s a huge part of the history of Piqua,” Smith said. The Fort Piqua Plaza, also originally known as the Plaza Hotel or the Orr Statler Hotel, was built in the 1890’s. The original grand opening was held on Oct. 27, 1891. Piqua Public Library Director Jim Oda said the building was designed by architect J.W. Yost, the same architect of the old courthouse in Troy. The engraving on the side of the building distinguishing it as the Orr Statler Hotel references William P. Orr, an industrialist who owned between 20-30 businesses, and S.K. Statler of a pioneer farming family. The original cost of building the hotel in 1891 was $200,000, which adjusted for inflation, would be around $5.5 million today. Oda said that the businesses on the building’s ground floor were what kept it going, and that the hotel part of the building was in its last years around 2000. Prior to the restoration finished in 2008, Oda said that the last major remodel of the building was done in 1914. In the 1890s, the building was host to the Piqua Anti-Saloon League, which lobbied for Prohibition, and later became host to the Rathskellar in the basement of the hotel in 1932, acting as a bar during Prohibition. “A lot of things have happened here,” Oda said. A number of U.S. presidents have visited the hotel, including William McKinley, Teddy Roosevelt, William Taft, and Warren G. Harding. Oda said that they would go out onto the balcony and speak to crowds there. The building also played a part the northern civil rights movement in 1947, when the local chapter of the NAACP held a sit-in at the union bus terminal where Mulligan’s is currently located, Oda said. The Hotel Library Legacy Alliance was the private fundraising group for the restoration of the Fort Piqua Plaza. “There were 11 (members) on the Hotel Library Legacy Alliance, and we worked on the project — the restoration — for almost seven years, just to get it to where the construction began,” said Alexander, who was also a member of the alliance at that time. Other entities like the city could access different types of funding, like economic development grants and an Ohio EPA vertical brownfields grant. Oda explained that they had two architects for the project: Jeff Ray, a restoration architect, and MKC out of Columbus, who is best-known for libraries. The construction work for the restoration took approximately a year and a half. The Friends of the Piqua Public Library include Ruth Koon, Cindy Lillicrap, Julie Benkert, Joyce Jenkins, Doug Stillwell, Christine Casto, Donna Wilberding, Kathy Alexander, Don Smith, Susan Haas, and Monti Mohler, among others. In addition to the upcoming gala, the Piqua Public Library will be holding special exhibits and tours on Saturday, Oct. 20, from 10 a.m. to 5:30 p.m.
https://www.dailycall.com/wp-content/uploads/sites/30/2018/09/web1_120117mju_piqua_christmasonthegreen_aerial.jpgMike Ullery | AIM Media file photo Fort Piqua Plaza illuminated during the 2017 Christmas on the Green celebration. A gala to celebrate the building’s restoration and reopening 10 years ago is planned for Nov. 16. Invitations and tickets will become available in October.